I've made lots of reading commitments this year (though not nearly as many as some bloggers manage!). One of the most important to me was my pledge to myself to read more books I already own, which in turn led to my more recent pledge of reading only books I already own over the course of the summer. Where should I start? What am I missing (with the caveat that of course there are dozens of other Victorian authors out there, but I am trying to stick with books I already own!)? What are your favorite Victorian titles? Glad you're joining us on this adventure! -The Woman in White is FANTASTIC. -I'm reading Cranford for the Celebration right now! -The Picture of Dorian Gray is one of my all-time favorites (I've read it a few times). I've read The Moonstone and loved it, so I'm thinking The Woman in White will have to stay on my list of three - especially if it warrants adjectives in all caps! Looking forward to hearing what you think of Cranford. I'm reading The Tenant of Wildfell Hall and LOVE it!! But from your list? I highly recommend Jane Eyre and A Tale of Two Cities. Oooh, conflicting opinions on Tale of Two Cities here. Now I might have to read it just to make up my mind. The Woman in White is definitely fantastic. I'm a huge fan of Thomas Hardy and am rereading Tess for the celebration. Look forward to seeing what you choose - happy reading! Thanks, Cat! Tess is one of my dad's favorite books, so I've been meaning to read it for ages. Loved "The Woman in White" - start there! Wilkie Collins' other well-known book, "The Moonstone," is also great. If you have time, add that! And "The Tenant of Wildfell Hall" by Anne Bronte, who is totally underrated. I've read most of your, list, which includes two of my favorite novels of all time, Jane Eyre and Bleak House. However, I wouldn't recommend Bleak House if you haven't read Dickens, because it's huge, about 800 pages, and it's really complex. I fell in love with the BBC miniseries so I already knew the story, which helped a lot. It's really worth it. A Tale of Two Cities is okay but not my favorite. If you want to tackle a shorter Dickens, I'd suggest Great Expectations or Oliver Twist. Cranford is also fun, a little quirky. The narrative is a little choppy -- it's really a series of vignettes about life in a small town. Dorian Grey is good too. I liked The Woman in White but I found parts of it dragged. Hardy's not my favorite, I've only read The Mayor of Casterbridge and Tess, which underwhelmed me. I'm a huge fan of Anthony Trollope and I always suggest The Way We Live Now. It's long but I found it to be a very quick read. The Barsetshire series is also excellent. The Warden is the first novel, the shortest in the series. It was a little slow starting but it's worth reading it first. Lady Audley's Secret by Mary Elizabeth Braddon is a really fun read. 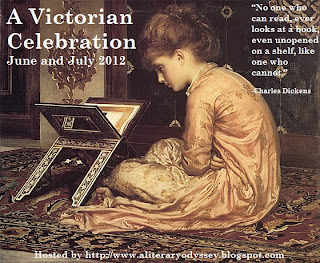 It's the quintessential Victorian sensation novel. Not much substance but it's a real page-turner. Thanks for the input on Bleak House, Karen! It's one of my husband's favorite Dickens, but I think your advice to start somewhere else makes sense. So far, I've only read his Christmas novels (every year) and Great Expectations (as assigned reading in school). I'm getting a mixed bag of input on A Tale of Two Cities, here, which makes me want to read it just to choose a side! Thanks for all the other suggestions - my reading list just keeps on growing. I say start with A Woman in White. I've been wanting to try a Wilkie Collings book. I did like the Moonstone, so he's definitely on my list! Jane Eyre and A Woman in White for your challenge; try to add Wuthering Heights and The Tenet of Wildfell Hall to your TBR list! Elsewhere on the Interwebs: Scene of the Blog!